2004 reissue on Spalax Music, distributed through MG.ART. 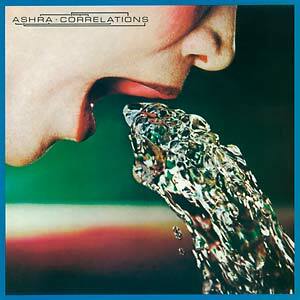 Correlations, originally released in 1979, is the third album from Manuel Göttsching's Ashra project, but the first album by the Ashra band -- the first two Ashra LPs (1977's New Age of Earth and 1978's Blackouts (SPA 14759LP)) were Göttsching solo albums. Here, the music is performed by Göttsching (guitar, synthesizer, sequencer), Lutz Ulbrich (guitar, synthesizer, piano, mellotron), and Harald Großkopf (drums, percussion, synthesizer). Cover art by Hipgnosis.